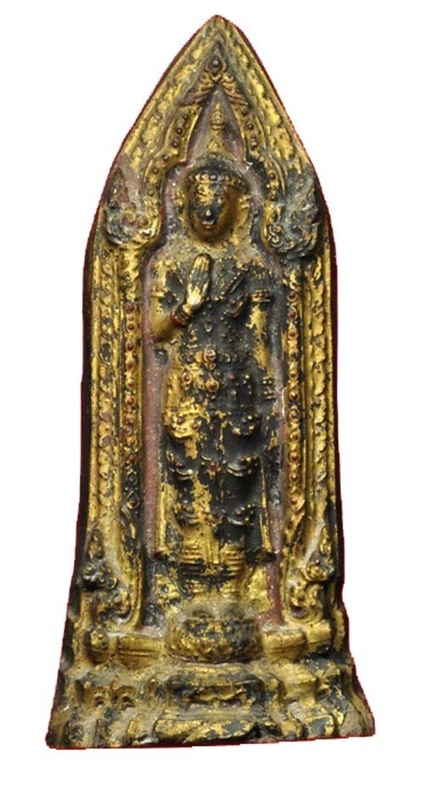 Pra Kru Kone Samor Pim Pang Rampeung (Friday Buddha) Sum Ruean Gaew Nuea Din Phao - Ayuttaya Period Buddha Amulet from 2430 BE Hiding Place Find. 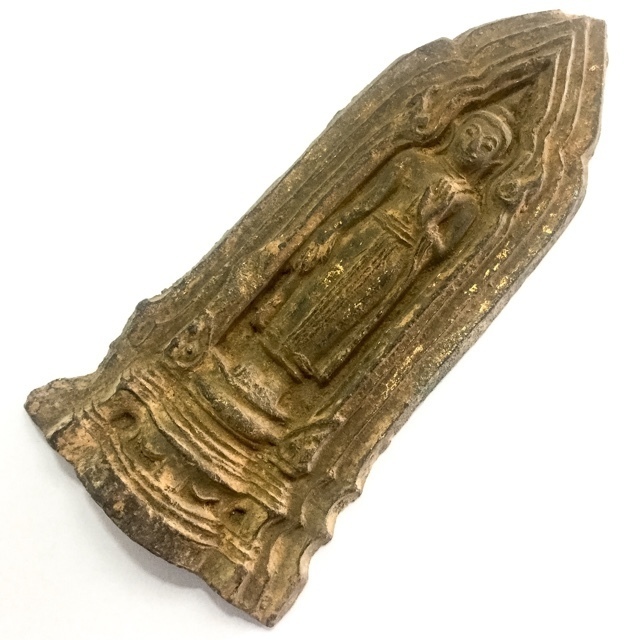 The Ayuttaya Period lasted between 1893 BE, and 2310 BE, making this amulet well over 2 Centuries Old. After the episode where two merchants Tapussa and Bhallika had seen the newly Enlightened Buddha, made their offerings and left (these were the first two laymen ever to become disciples of the Buddha), the Lord Buddha rose from where he was sitting under the Rachayatana tree and moved to sit under the Acabhalanikaroda tree and spent time considering the wondrous and most subtle Dhamma he had realised. He considered how difficult it was to undertsand, and the fact that it was almost impossible to grasp for the average mind. He then became a little doubtful that it was worth it to try to explain and teach to Human Beings, and declared to himself that he would not teach the Dhamma to others. At that time, Lord Brahma became aware of what the lord Buddha was thinking, and sent a host of Angels and Deities to go visit the Buddha under the tree he was sitting. They went and paid reverence, and begged the Buddha to please teach the Dhamma to the people. To teach those who have dust in their eyes, and those who are devotees of the Buddha, in the hope that some may attain Enlightenment. The Buddha then took this into consideration, thinking of what previous Buddhas had usually done; namely once they attained Enlightenment, and before entering Nirvana, they would teach and preach the Dhamma and spread it widely for the sake of those who came after them. Some, with great difficulty, and other with Ease could understand, and others not at all. He thus compared them to Lotus flowers that are born under the water and grow in the water; Some flowers remain under the surface, some on the surface, and some rise above the surface. Those people who are like the lotus which has risen above the water and recieves the Sunlight will eventually bloom, and the flower which blooms will also have variations. Some people will attain the realisation of Dharma quickly and easily because they have low amount of cravings and desires, and made great merit in life. Others will attain the Dhammma, but slowly – this type of person should still recieve repeated lessons of the basic principles in order to help condition the character until his practise is safely ensured and constant. This is how the Dhamma should be taught, in order to prevent the Buddha’s teachings to not be in Vain. The basic Dharmic principles should be given to all, with the exception of those compared to the lotus underwater, Soft Lotuses who will eventually become nothing but fish food. At this point, the Buddha declared that he would remain on earth as a living Human Being until the day that the Buddha Sasana was founded and fully established to safley survive the passing of time, for the sake of those Humans who wanted to try to Enlighten. In remembrance of Buddha considering Teaching the Dhamma and establishing Buddhism for the sake of all beings, the Statue of Buddha in the pose of “Pang Rampeung ” (consideration) was created. For your knowledge and for reference study, the different postures of Birthday Buddhas are as follows; Monday Buddha; Pra Ham Yati (forbidding relatives with hand/s outstretched) Tuesday Buddha; Pra Saayaas (Sayasana - Reclining Buddha), Wednesday Daytime; Pra Um Badtr (Holding Almsbowl), Wednesday Evening; Pra Welalai, Thursday Buddha; Pra Prok Po, Friday Buddha; Pra Rampeung (standing with arms crossed over chest), Saturday Buddha; (Pra Nakprok - Naga Throne), Sunday Buddha; Pra Thawaay Naedtr (hands crossed over the stomach). That are already of an age of around two centuries old, and if properly taken care of and prayed to properly, should still be around in another thousand years. The Pra Kone Samor, is considered a 'Pra Nirandtarai' (free from all dangers) Votive Tablet, with immense Kong Grapan Chadtri and Klaew Klaad Powers Who would not be proud and instilled with faith to possess such a sacred, ancient and historically important votive tablet?